GOAL HawksBen McEvoy scores a goal from a Turnover. Collingwood has scored from 18 of their 24 inside 50s since halftime. GOAL MagpiesAlex Fasolo scores a goal from a Turnover. BEHIND MagpiesBen Sinclair scores a behind from a Turnover. The Magpies getting it out of the centre at will this quarter, winning the centre clearance count 61. BEHIND MagpiesJesse White scores a behind from a Stoppage. GOAL MagpiesPatrick Karnezis scores a goal from a Turnover. Collingwood has had eight of the last nine inside 50s, starting to put the game away. GOAL MagpiesJordan de Goey scores a goal from a Stoppage. Patrick Karnezie just booted his second goal. He is the equal leader at the club for tackles (five) and score involvements (seven) across the game. BEHIND MagpiesBen Kennedy scores a behind from a Stoppage. GOAL MagpiesJamie Elliott scores a goal from a Turnover. GOAL HawksJack Gunston scores a goal from a Kickin. RUSHED BEHIND to Magpies from a Turnover. Kicking efficiency tied at 67 per cent across the whole ground. Forward of centre the Pies are going at 59 per cent however and the Hawks are only at 49 per cent. Collingwood has been able to find more targets inside 50, grabbing 13 forward 50 marks to the Hawks five so far across the game. BEHIND HawksLiam Shiels scores a behind from a Turnover. Jordan de Goey was never a ball magnet as a junior, but always used it well. Tonight he has had seven disposals with an efficiency of 100 per cent. GOAL MagpiesCorey Gault scores a goal from a Stoppage. Tom Langdon continues to win the ball back for his side, winning five of the Magpies' 15 intercept possessions in the third quarter. 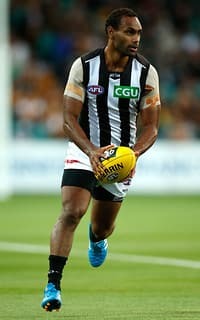 The Magpies top three players for score involvements that quarter were Travis Varcoe, Levi Greenwood and Nathan Freemanall three players who are yet to play a game for the club. GOAL MagpiesCorey Gault scores a goal from a Turnover. Hawthorn continue to be damaging when winning the centre clearance. All eight wins have gone inside 50 and five have resulted in scoresall of which have been goals. GOAL HawksLuke Breust scores a goal from a Stoppage. SUPERGOAL HawksSam Mitchell scores a supergoal from a Turnover. Collingwood has won eight forward half clearances for the game with a result of 2.2 on the scoreboard. The Hawks have won four forward half clearances, but none have resulted in a score. GOAL MagpiesLevi Greenwood scores a goal from a Stoppage. BEHIND HawksJames Sicily scores a behind from a Kickin. BEHIND MagpiesTravis Varcoe scores a behind from a Turnover. GOAL MagpiesAlex Fasolo scores a goal from a Stoppage. BEHIND MagpiesCorey Gault scores a behind from a Turnover. BEHIND MagpiesPatrick Karnezis scores a behind from a Turnover. BEHIND HawksJack Gunston scores a behind from a Turnover. Collingwood won 28 intercept possessions across the first half. 10 of these came from youngsters Marley Williams (six) and Tom Langdon (four). RUSHED BEHIND to Magpies from a Stoppage. GOAL HawksJack Gunston scores a goal from a Turnover. BEHIND MagpiesTim Broomhead scores a behind from a Stoppage. Jed Anderson missed all of last season with illness and injury. Playing well tonight though, with 10 disposals and ranking No.1 across the game so far for metres gained. GOAL MagpiesJesse White scores a goal from a Stoppage. BEHIND HawksDallas Willsmore scores a behind from a Turnover. BEHIND MagpiesSteele Sidebottom scores a behind from a Turnover. BEHIND HawksJermaine Miller-Lewis scores a behind from a Turnover. GOAL MagpiesBrodie Grundy scores a goal from a Stoppage. 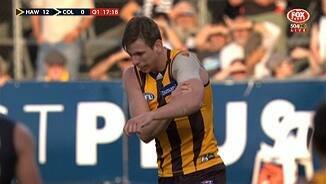 Make that five Hawks centre clearances resulting in four goals, one of which was the first ninepointer of the season. SUPERGOAL HawksJames Sicily scores a supergoal from a Stoppage. The Hawks start the quarter with their fourth centre clearance for the gamethree of which have directly led to goals. GOAL HawksJed Anderson scores a goal from a Stoppage. Collingwood outtackled the Hawks 20 - 10 for the quarter. GOAL MagpiesJesse White scores a goal from a Turnover. GOAL MagpiesSteele Sidebottom scores a goal from a Stoppage. The first five goals of this game have all been kicked from set shots. GOAL MagpiesAlex Fasolo scores a goal from a Kickin. 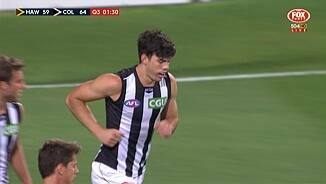 Both of Collingwood's goals have come from forward half intercepts. Collingwood has scored from four of their first six inside 50s, but have only scored 1.3. Ben McEvoy has taken two contested marks inside the forward 50 in the opening 10 minutes of the game, he took nine in this zone across the whole of last season. GOAL HawksBen McEvoy scores a goal from a Stoppage. GOAL MagpiesTyson Goldsack scores a goal from a Turnover. BEHIND MagpiesJosh Thomas scores a behind from a Stoppage. Two free kicks lead to two centre clearances for the Hawks. Both were converted into the first two goals of the game. 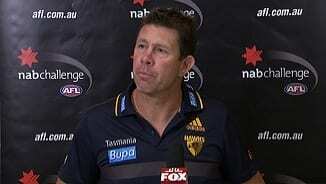 In the 2014 NAB Challenge, the Hawks won all three games by an average margin of 101 points. The Magpies won just one of their three games. Collingwood has eight on the bench tonight with two subs. The Hawks have two fewer players on the bench but no subs. Welcome to Aurora Stadium for the Hawthorn v Collingwood Round 1 clash. 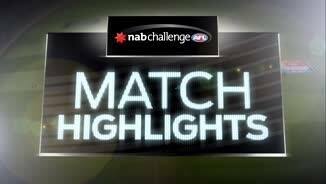 TRAVIS Varcoe and Levi Greenwood's second comings as AFL players started in impressive fashion as Collingwood overcame a youthful Hawthorn side by 44 points in a feisty NAB Challenge opener on Thursday night. While it was only the first step in a marathon season, the star recruits and stand-in captain Steele Sidebottom led a Pies midfield lacking some of the game's biggest names. In recent seasons, it's been difficult to imagine Nathan Buckley's side without Scott Pendlebury, Dane Swan and Brisbane Lion Dayne Beams running the engine room. But cheered on by a vocal Magpie Army - despite the match being played at the Hawks' second home Aurora Stadium – ex-Cat Varcoe and former Roo Greenwood showed plenty in an encouraging 0.17.14 (116) to 2.8.6 (72) win. The toughness of No.5 draft pick Jordan De Goey – who already looks a ready-made player – and a fit-looking Jesse White also gave the Pies plenty to get excited about. De Goey was particularly influential early but contributed across the four quarters and kicked a long set shot goal, while White booted two goals and arguably had the better of Hawthorn's prized recruit James Frawley. White endured a mixed season after crossing from the Sydney Swans last year, but he enjoyed being the focal point with Cloke out of the side. 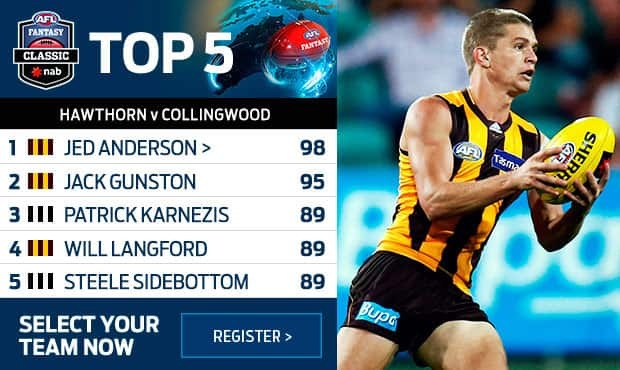 The Hawks were severely lacking in experience, with stars Jarryd Roughead, Jordan Lewis and Josh Gibson among five premiership players joining skipper Luke Hodge, Cyril Rioli and Shaun Burgoyne on the sidelines before the bounce. Despite the defeat, Hawks fans would have been pleased to see returning Jed Anderson show he is keen to make up for lost time with a silky onball performance and a classy goal. Sam Mitchell and fill-in captain Liam Shiels worked hard throughout, while James Sicily showed he is not far off making his senior debut. Hawthorn's night started on a sour note when promising defender Kaiden Brand was helped from the field cradling his left shoulder after a marking contest and the 20-year-old played no further part in the match. 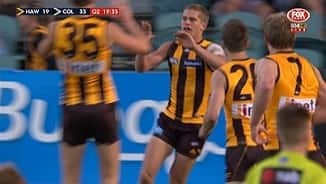 Hawthorn: Jed Anderson is champing at the bit to force his way into the Hawks' best 22, judging by the classy midfielder's output in his first game since shoulder surgery wiped out his 2014 campaign. The 21-year-old's performance would have heartened Hawks fans, who are keenly aware Brendan Whitecross is also waiting in the wings for his chance. Knowing that duo Jonathan O'Rourke and Alex Woodward are also pushing for spots in the Hawks' premiership midfield is a daunting thought for rival clubs. Collingwood: It's fair to say Jesse White endured a mixed first season in the black and white, but with Travis Cloke sitting out of the opening NAB Challenge match, White shone as the focal point of the Magpies' attack. At times last year the ex-Swan looked a little lost roaming up the ground while Cloke stayed at home. 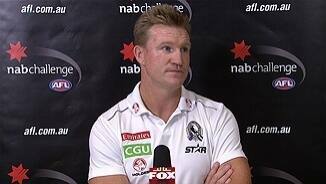 Nathan Buckley knows he needs to ease the reliance on his star goalkicker and a firing White, who has trimmed down after a strong pre-season, would ease his concerns significantly. Hawthorn: Big-name recruit James Frawley was in the thick of the action early and the ex-Demon was a touch slow when he was caught holding the ball, but the summer rust wore off in his tough battle with Jesse White. Draftees Teia Miles and Daniel Howe showed encouraging composure down back and strong-marking forward James Sicily expressed his self-confidence with a booming super goal. Jermaine Miller-Lewis looked dangerous in attack, Jared Hardisty ran hard through the middle and Marc Pittonet competed well. Collingwood: No.5 draft pick Jordan De Goey made his presence felt early with a crunching contested mark, impressed with his hardness at the contest and was very good as a link-up player across half-forward. Patrick Karnezis showed his class with a sublime checkside goal from outside the boundary line, while former Cat Travis Varcoe was prominent and had more time with the footy than most. Levi Greenwood barely missed a beat with his work at the coalface and Jack Crisp threw himself into the contest. 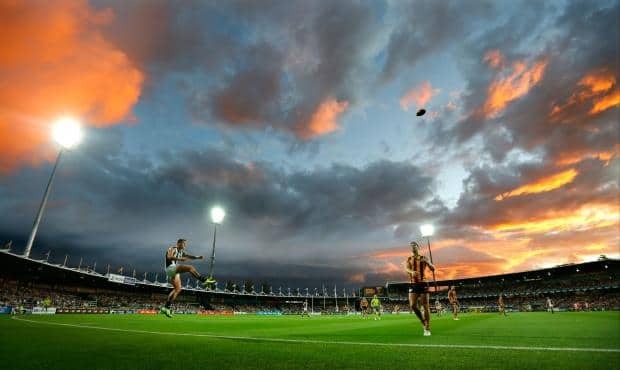 Tasmania showed off its charm in Thursday night's clash at Aurora Stadium. Picture: AFL Media.